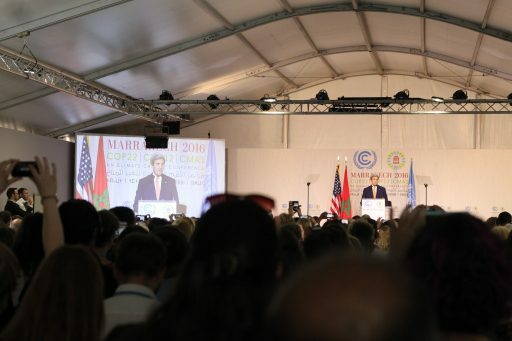 In the official programming, COP22 is often described as the “COP of Action”. The meetings of the conference focus on specific action steps needed to achieve the all-encompassing priorities of the Paris Agreement: from agreeing on funding and financing mechanisms to fund the adaptation and loss and damage agendas; to creating pathway to low-carbon economies to ensure the rapid emission reduction and mitigation of climate change, to agreeing on mechanisms for technology transfer and capacity building that will help all countries meet their commitments and prepare of the unavoidable, already ‘locked-in’ effects of climate change. On top of pushing for specific agenda points that will form official outcomes of the COP22, the civil society is pushing for increased ambition from the present parties: the Paris Agreement will not come into life until 2020, but at current emissions levels, the carbon budget for a strong likelihood (66%) of keeping warming below 1.5°C could be exhausted in as little as 6 years. According to Climate Action Network, if more is not done, the Paris Agreement will be “too little, too late” (reference: http://climatenetwork.org/sites/default/files/eco_1_-_in_between_edition_english.pdf). The Emissions Gap report launched by UNEP at COP22 added to this urgency. The findings of the report looked at current national commitments to reduce emissions couldn’t be more chilling. The current pledges are overshooting the reductions needed to keep the warming under the 1.5°C by SEVENTEEN GIGATONNES of greenhouse gas emissions, for every single year between 2020 and 2030. To give you an idea, what this means: to avoid one gigatonne of emissions, we would have to shut down the entire European transit and transport system… for one year. 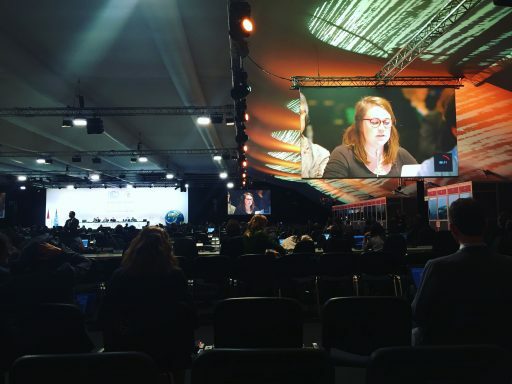 The push for higher ambition is also on the official agenda of the meeting, and as I write it the parties to the Paris Agreement are gathering for a “high-level facilitative dialogue on enhancing ambition” – another mouthful, but without a convenient acronym. The countries are going to discuss stepping up the mitigation ambition and cooperation mechanisms that can be used to raise ambition. Calls are being made for countries to take immediate domestic steps to raise overall ambition. The youth observers present at the COP are so far not impressed with the progress being made; the verdict after the first week of the negotiations was that negotiators showed little sign of tangible progress and called on parties to take concrete action by defining a framework that allows the transition from abstract objectives to concrete actions with well-defined targets and clear roadmaps. The youth called for such a framework to reflect ambition at every level and address issues related to adaptation, loss & damage, human rights and health. With the APA (aka the Ad Hoc Working Group on the Paris Agreement) closed yesterday, the second week has not started with much more progress: the key decisions of this political body of the UNFCCC mandated with coming up with the “playbook” for bringing Paris to life were that some more things should be discussed and some decisions definitely be taken in its next meetings coming up in 2017. Not a single press conference or expert panel can happen at COP22 without the “Trump” question popping up at some point; the US election results have dominated the moods at the COP for good part of the first week, among concerns of the US attempting to withdraw from the Paris Agreement or even UNFCCC, or more immediately reducing or halting the flow of funding (US is now biggest financial contributor to the UNFCCC). While nobody can tell what will actually happen (talk of predicting Trump), the good news is that many countries including China and the countries of the High Ambition Coalition, except USA, made statements reaffirming their commitment to ambitious climate policy. With three days to go, and many major segments only starting, we are yet to see what will the concrete outcomes of the talk will be, although the chances of COP22 of inscribing itself in history with bold decisions, grand steps, and ambitious undertakings seem pretty small. With the feet dragging and the slow progress, observing the COPs can be an exasperating task. But the COP is not just the big talking heads; in the next few days I’ll bring you some insights from exciting initiatives that are being discussed beyond the main plenaries. But for now I’m off to a press briefing. Over and out! Ewa Iwaszuk is former Networking Coordinator of IYNF and is currently in Marrakesh as an official delegate of the COP22.